I was gifted these gorgeous Rose Hips today. Aren't they amazing. Some of them are about 1" across!! They were attached to some Rose cuttings I had asked for. The Hips are the reason I wanted the rose cuttings actually. I don't have a clue what the roses look like, and it really doesn't matter. 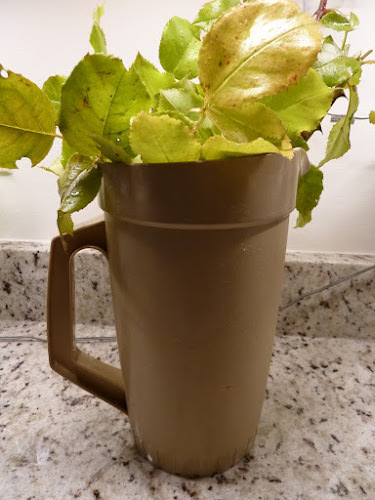 My very old Tupperware pitcher with the Rose cuttings soaking until I can get them planted. 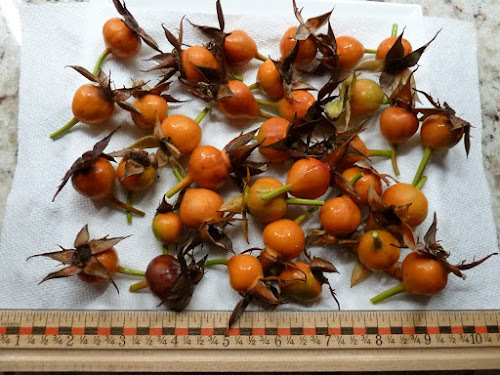 So what are you going to do with the rose hips? I often go down the country roads picking stems of them for fall centerpieces. I am going to use them in my winter potpourri!! I will do a post when I get at that project. 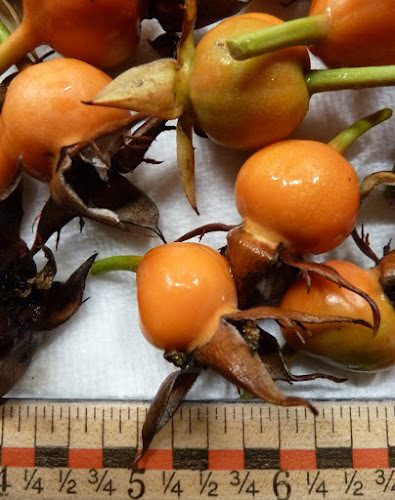 I usually associate those rounder hips with Dog Roses, the sort that create an edible hedge, ie, if you use the hips for making rose hip syrup, etc. I'll look forward to seeing a post on your winter pot-pourri, it's not a use that I'd thought of! Hi Caro...I googled Dog Roses and I hope that is what it is!!! I love old fashioned roses. I had planned on putting them along a fence, so that will work perfectly!! I will be making my potpourri soon! !